With a surprising amount of horsepower under the hood, you couldn't ask for more from the Asus GL551, save for maybe a better screen. In general, gaming laptops are an expensive proposition. 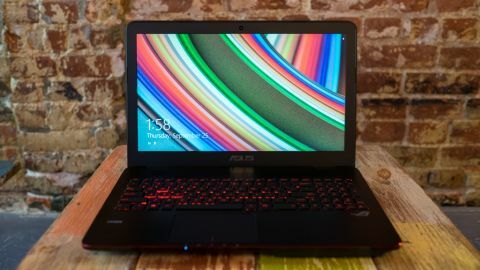 With most gaming laptops starting at $1,500 (about £923, AU$1,720) or more, a mobile gaming machine a hard sell when you can just as easily put together a desktop with better performance and for less money. A few machines, like the MSI GE60 Apache, help soften the blow at an affordable $1,250 (£1150, about AU$1,433). Now, Asus meets the new pricing floor with its $1,099 (about £673, AU$1249) GL551. The price tag isn't the only thing this 15.6-inch notebook has going for it. Asus has equipped this entry level rig with a 1080p screen, Intel Core i7 processor, and a respectable Nvidia GeForce GTX 860M graphics chip. All the boxes have been checked to earn the title of "gaming machine," but has Asus cut too sharp of corners to reach budget buyers? Asus hasn't cut any corners in build quality with the GL551. The notebook, however, is a mix of premium touches and compromises to keep an affordable price point. The lid is one large sheet of brushed aluminum, painted in a midnight black with a glowing Republic of Gamers insignia etched in the center. Open up the laptop, and you'll be greeted by large plastic bezels surrounding the 15.6-inch screen. Meanwhile, yet another continuous sheet of aluminum covers the keyboard deck as well as the palm rest before the rest of the laptop ultimately trails off to a portly plastic body. One odd proportion quirk about the GL551 is its rounded frame juts out on its lower right. Overall, there's nothing chintzy about the laptop, but it's clear Asus has focused on making the GL551 look good where it actually matters. LAN party rivals will recognize the ROG symbol, and it's easy to appreciate the laptop's sturdy interior. The only small gripe I have with the GL551's chassis is that there's only one exhaust vent on the laptop's left side. This small outlet pumps out concentrated heat so regularly you could keep your coffee warm with it. Thankfully, it's not an uncomfortably hot current. (You may even enjoy the constant stream of heated air during colder months.) However, you should ensure the vent is not blocked off when placing the gaming notebook near a wall or on your lap. As far as gaming laptops go, the Asus GL551 tries not to call too much attention to itself. The notebook doesn't threaten to turn a room into a multicolored disco, nor does it have any aggressive design quirks better suited for hypercars. If anything, the GL551 attempts to pass off as a gussied up multimedia machine, with a red backlit keyboard and crimson chamfered edges on the laptop's lower lip. Unfortunately, this toned down aesthetic is marred by the pervasiveness of Asus's Republic of Gamers logo. It would have been enough to just embroider the laptop's lid with the logo, but Asus went a bit too far, stamping the tribal tattoo on the palm rest as well. Meanwhile, Republic of Gamers is printed prominently above the keyboard. It's as if Asus is saying "hey, don't forget this is a gaming machine."